Heading into college, one of my biggest fears was gaining the Freshman 15. However, as soon as I arrived on campus, I realized that it's actually pretty avoidable, especially in my circumstances given that Lehigh is so hilly and I really can't go anywhere without walking up or down a few flights of stairs. That said, college still isn't a free-for-all, and overdoing it on sugary drinks at parties, 2 AM post-drinking feasts, and making unhealthy choices in the dining hall all can contribute to poor health.. Since my schedule is so busy, I don't go to the dining hall for breakfast, and I usually get hungry between lunch and dinner. 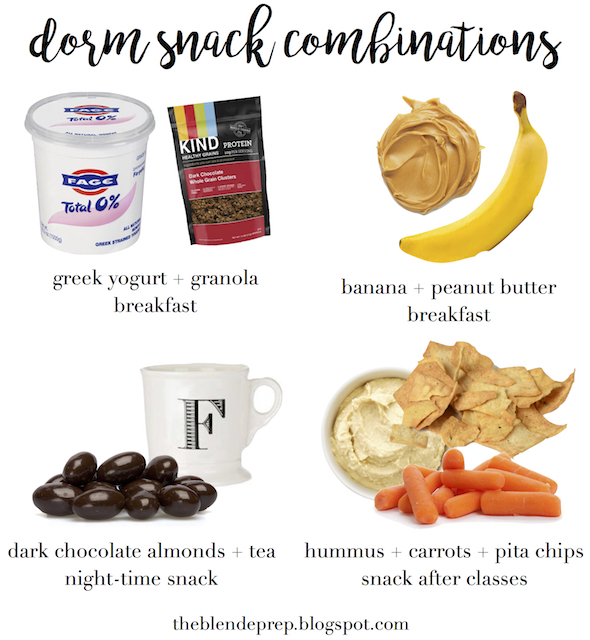 I stocked my dorm with healthy snacks and breakfast foods so that I can always eat breakfast and make sure there are always a few options for a snack when classes end and I'm back in my dorm for a few hours before dinner. I love that my room is full of healthy options so I can eat something whenever I get hungry and not have to feel guilty about it! Lime La Croix is seriously my favorite thing to drink so I almost have a can open on my desk. Before bed I usually want something sweet and I'll opt for a cup of my favorite tea and some dark chocolate almonds. For breakfast I usually have greek yogurt and granola, or a banana with peanut butter. After classes I'll go for an apple and peanut butter, or carrots and pita chips and hummus. Our fridge is stocked with a ton of random fruit too to mix and match as well! Above are a few of my favorite combos and they're all full of protein and fiber! Check out this post for more healthy snack ideas. What do you keep in your dorm? I didn't eat breakfast in the dining halls one time my freshman year haha; Fage 0% Greek yogurt split cups (the ones with the honey) and granola = breakfast. I also (and still do, even as a junior living off campus) stock up on granola/cereal/Lara bars. In my dorm, I always had unsalted popcorn; cheese, crackers, and fruit; and almonds to snack on or bring with me. I hope you're enjoying your freshman year! 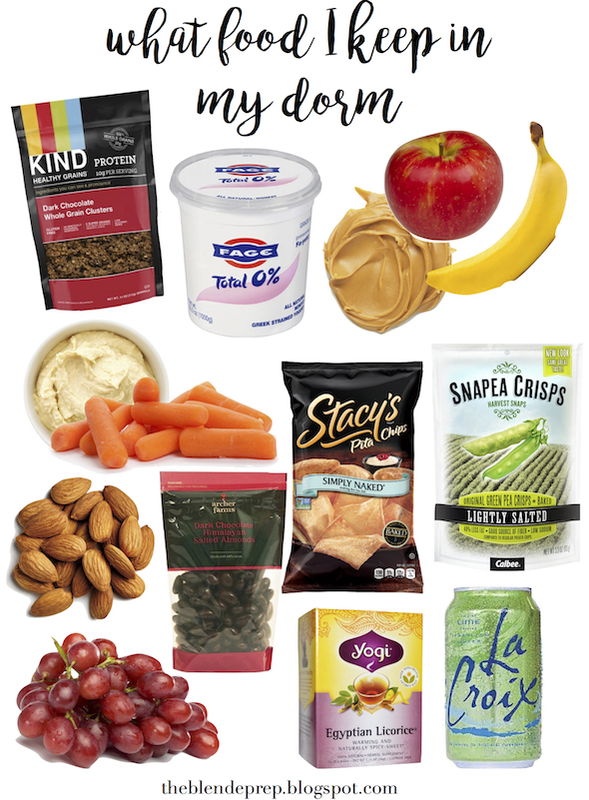 I did the same thing my freshman year, and I always needed to have snacks with me in my bag in case I got hungry during class (which was always) so healthy options were a must! I did the same thing in boarding school. Keeping healthy snack options in my room kept me full throughout the day and avoided over-eating unhealthy options.